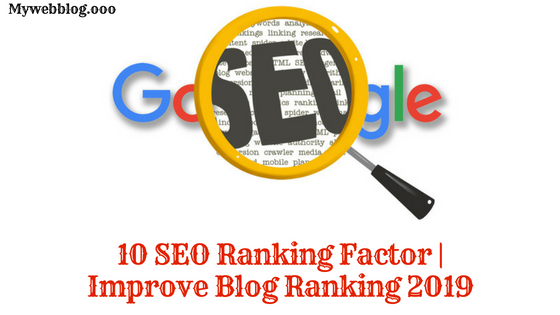 SEO Ranking Factor: Hello Friend's In today's article, we are going to talk about SEO Ranking Factor, from which you can understand Website / Blog's SEO well and Improve your Website Ranking. You should have a good knowledge of SEO (Search Engine Optimization) to rank Website / Blog on the Internet, and you should also know what has changed in the Recently Search Algorithm. Because of these changes, the Website Search Result is showcased at the top or below. Now if your website is showing on First Page, you will get good traffic too and you will get more benefits but if your website Search Result is showing below, then you need to work very hard to make Traffic Increase. it occurs. There are a total of 200 + Rules under SEO Ranking Factor, which you have to pay attention to, but there are some of these Rules which are the most common and important. So if you do not follow these rules, then your website will be ranked down and you will not have any special advantage from your website, so let's talk about 2018 Essential SEO Ranking Factor, but with that you There should be complete information on On Page SEO and Off Page SEO which you can read on our website. It is important to understand it before SEO because when you understand something well then you can take advantage of it, so let us tell you about some of the 10 SEO Ranking Factor, which is called SEO Ranking Factor It is very important to have. Blog Ranking is also Depend on its Design as if you upload a very nice template on your website and also customize well, but it is not Template Mobile Friendly or SEO Friendly. Now because there is no SEO Friendly, he does not provide Search Bots with correct information of your Headings, Subheadings, Images, and Content, so that Bot does not know about your content and that your Blog is on Search Result Do not do it. Similarly, if your Template is not Mobile Friendly then it does not show properly on Mobile so that Search Bot does not take users to Mobile Search through your keywords or do not show them on your Blog Post. Does. Because of this, you lose a huge audience, so you should buy Mobile Friendly Template for your website so that this type of problem is not with you and you can do great traffic. Which is very much needed for SEO Ranking Factor. In order to understand the difference between the search result or whether the website is being secured, if you first search for a topic on Google, you will see that Google is now only showing the websites that are Secure. Now the question is how to secure the website and why Google is doing this? By placing the SSL certificate in your domain name, HTTP is written as https and instead of the i button, Secure is written so that you know that your website has become Secure. To understand clearly, you can see the address of our website. Why is Google displaying Secure Sites first? In 2017, Google's policy was that it would take its readers to the website on which the information related to that topic is more accurate, but in 2018 security has also been added to this policy. That's because Google now wants to take care of its readers and only wants them to be taken to Secure and Safe Sites so that users have no problem of any type. Website Loading Speed Search Ranking was by us because Speed likes everyone and today is the time of 4G where people want to access all things immediately, so Google also wants to send their readers to those websites. Let's get loads of which is OK.
To keep the Loading Speed of the Website, you should do some important things like Focus, Do not Use Gif Images, Upload Images of Heavy Size on Your Website, Do not Use Background Images in Template, Slider Available Themes Do not use, do not use more Widgets / Plugins. SEO Optimized Content means that you customize your upload to your website in such a way that the Search Engine can easily understand your content and show it at the Top on Search Result. For example, the correct Title, Images, Internal Links, Headings & Sub-Headings, Paragraphs, Keyword Placement are important things for the article, which should be addressed and used in the right place at the right place, so that Search Bot can understand them. Which is very much needed for SEO Ranking Factor. By doing a Keyword Research, you can know about how much people are searching for what keyword in present time and how much competition is on that keyword because you do not write any good article by writing the article on the Competition Keyword. Can not rank it. Because there are lots of things important to be a Blog Post, if you are a beginner, or your blog is not yet 1 year old then you should write an article on Low Competition Keyword so that you can get good traffic. 1. Creating Traffic-Backlinks lets people know about your website and can click on Direct Link and visit your website. Which makes Traffic Increase to a great extent on your website. 2. Website Reputation- Website Reputation is important for search engine because when you link to any website, Search Bot is aware of them and that website is referencing your website in a way, so Bot According to the reputation of your website is more because Popular Website is representing you. Now a question here also comes from how to create Backlink and what kind of sites should you create backlinks? So, how we created the backlinks, we have already published the article, you can read it and now it is a matter of which types of sites should you create backlinks, then here are two things important. The first website you are creating Backlink, Alexa Ranking should be better than your Alexa Ranking. The website should not be Adult as well as being Secure and Spam Free. Which is very much needed for SEO Ranking Factor. Now in Image Optimization, some people have spread the wrong things on the Internet, such as Image Optimization means whatever image uploads to your website should be on the Alt tag and this is called Image Optimization. But there is also some things in Real that should be in your image like image size should be reduced, your image should be representing your content, your image should also contain tags, the image should be described and Image must be the owner's name. Through which Search Bot can not only get information about your image, but it can recognize your image well and show it on Google Image so that you can better promote your website. Social Sharing simply means that you share your articles on social media, so that people can know about your article and visit your blog but the question is, what about social sharing for SEO Importance is. When you share anything on social media sites, then people are either engaged in action or either Reaction shows that what the people's opinion about that content is, and how many people like that content. Now if you share a Content / Blog Post, but people are not giving any Response to it, which means that your content is not good for people who are not liked and that your Post Search goes down from Result. That means Social Response also now has a lot of impact in Search Ranking so you must share your articles on social media sites as well as social Share Buttons on the site so that people can share your article. When you publish an article on your blog / website, that article also becomes a URL, now if that URL is longer / longer, then it will take more time to read, as well as some of your URL in Search Result Part can also be cut. Since the Word you have written does not show there, now you have to understand a simple logic. Search Bot shows up only on those websites that get it fast because they have to give Search Result quickly. In such a case, if you have a long URL or are cutting, Search Bot will also have time to read it and if there is a problem then it will not be able to find your blog post immediately and will show it below. Now on the other hand if you just write your Target Keyword in your URL, then it will only read Keyword so that it will instantly find the keyword in all the important places and it will show it at the top. Description means you understand that you have to create a small paragraph for promoting your blog post, which anyone can read about and understand your content and read most of the post in Post Repeat Title only because they think that by doing so, their Keyword will come again and again, which will result in their Ranking Improve. We tell you two things here that what is the value of description in Actual and it affects the ranking. 1- Place for writing your keywords: a Description is a place where you can write your Keyword and Alternative Keyword so that Search Bot gets your keyword immediately and it can show your article on the first page. Now there is a condition as well as your keyword should be maximum 3 times, but you have to always try to have your keyword written just twice. 2- Encourage People for Click: Through the description, you can tell people what information is in your blog post and also if you have printed the print show or video in your blog post also You can tell in the description. Because Screen Shot and Videos help people understand that they can learn all things to do that work easily with that article. Similarly, you can use different things which give people a reason to click on your article so that they click on it.